This weeks episode Agent Of SHIELD proves that the show can succeed if it dares to offer genuine character development through drama. As both Coulson and Ward are confronted by personal demons they show they are still the core two characters of SHIELD. For me ‘Writing on the Wall’ has been my favorite season episode so far and I must say Agent of SHIELD is becoming an appreciated show next to my Tuesday dose of Person Of Interest. As for this episode. I first discuss briefly what has happened in a summary and then I discuss the implications. We know since last season that then agent Phil Coulson was in charge of the TAHITI project tasked with reviving Avengers if necessary. 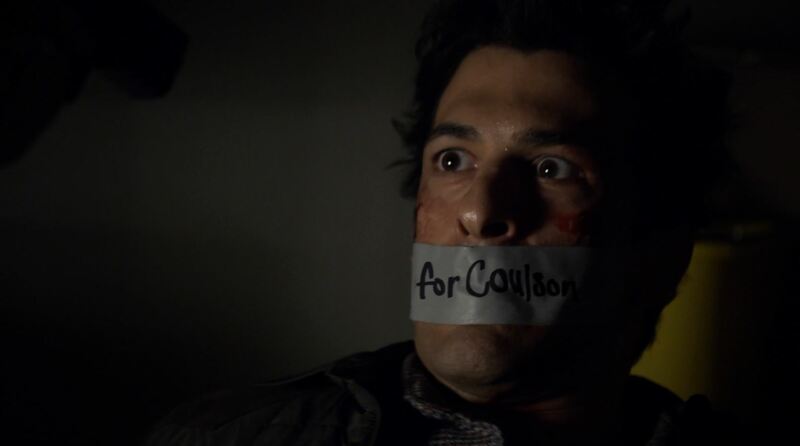 This episode ‘Writing on the Wall’ explores the consequences of his actions while he suffers from the after effects of the alien blood infusion. Apparently neither Skye (Chloe Bennet) nor Coulson were the only ones infused. Other agents dying volunteered and each slowly became psychotic. The decisions to wipe their memories had a temporary effect. Now one of them remembers his lust to draw the alien picture and kills his fellow agents to uncover what they can remember. For Coulson it is all too personal and after trying to recover the name of the agents he himself has a psychotic episode. 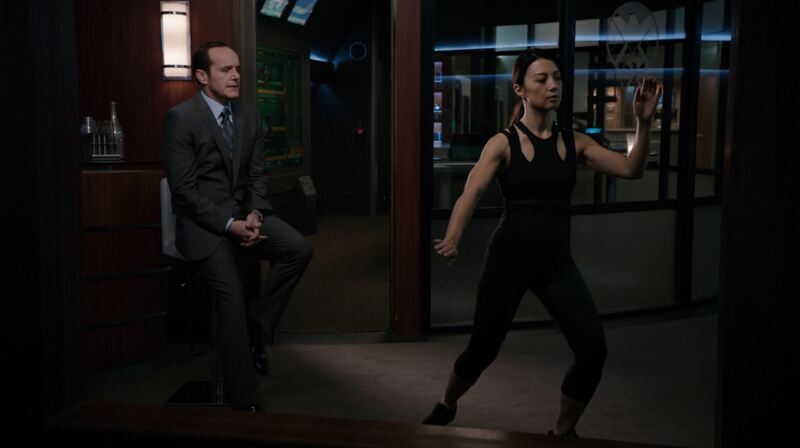 May (Ming-Na Wen) orders Coulson to be locked up for his own safety but he manages to trap Skye instead. 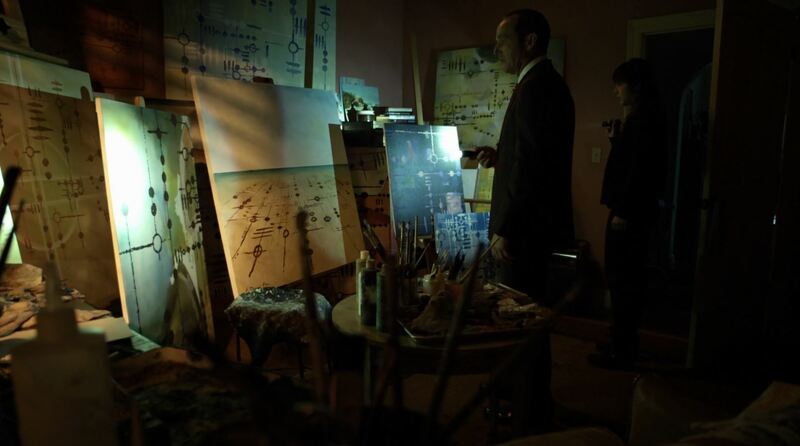 Coulson stops the slaughter among his fellow TAHITI subjects and discovers the elaborate drawings are a map of an ancient city. After he apologizes to every SHIELD agent for having a psychotic episode he tasks them to find the city before HYDRA can. He tells May his compulsion to draw the alien map has stopped. 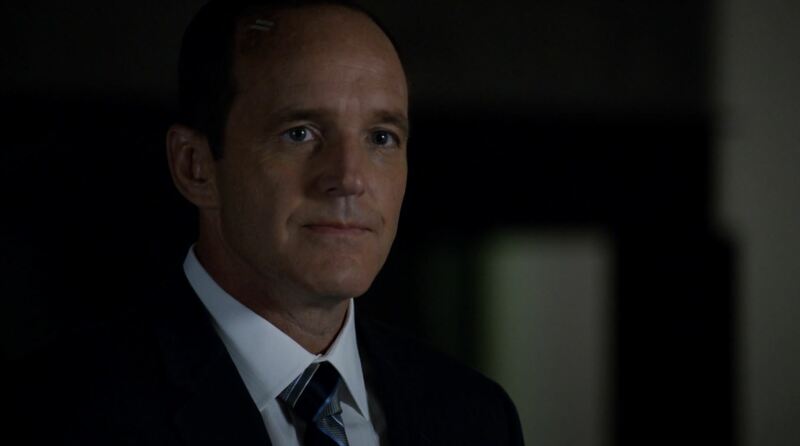 With this episode Coulson had to confront a number of personal demons. He himself ordered his TAHITI subjects to have their memories wiped. He also wanted the project to be stopped. The fact that he was revived on orders of then Director Fury makes this issue deeply personal. He can’t deny that he himself was an inch from becoming a homicidal SHIELD agent just intent on uncovering the secret of the alien drawing. It can also explain why at times his character seemed restless and abrasive, especially to Skye. Now that we know what the alien drawing means Clark Gregg’s character Phil Coulson can change to become the director he was supposed to be. 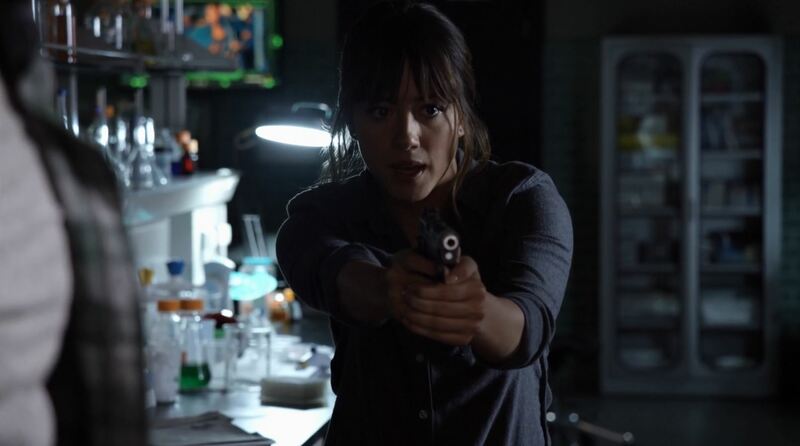 The no-nonsense attitude with which Joss Whedon handled this storyline proves that Agents of SHIELD has the power to marvel the viewer with every episode if only they dared to get out of their comfort zone. There is of course also a secondary story to ‘The Writing on the Wall’ and that is the search for Ward. After he escaped during I was doubtful he would rejoin HYDRA as he seemed to genuinely dislike what they stood for. To the surprise of agent Triplett and May Grant doesn’t immediately hide from SHIELD. He avoids being arrested after emptying a stash of currency and resources by publicly displaying his C4 primed suicide belt. Coulson tells them everybody to back off and just follow Grant. However, agent Bobbi Morse A.K.A Mockingbird who only has a brief role is easily unraveled by Grant when he decides to travel by bus but switches routes. 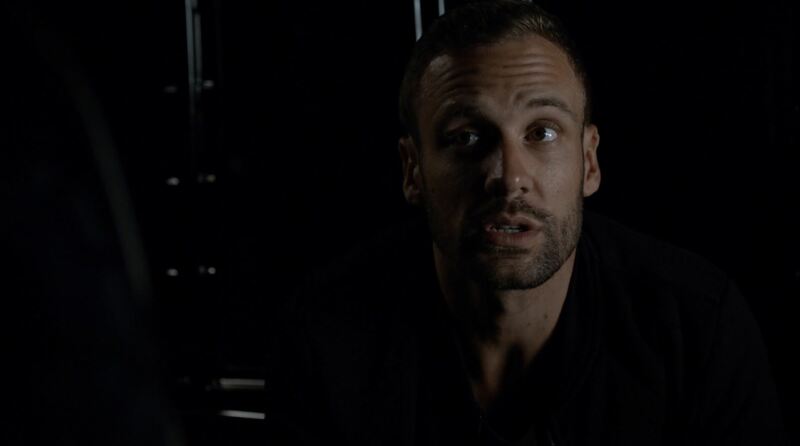 What Grant doesn’t know is that Hunter (Nick Blood) is on the other bus and he follows Grant to Boston. There Grant ingratiate himself with HYDRA second Sunil Bakshi. Just as Hunter, May, Bobbi and Triplett attempt to take them both out they discover that all the HYDRA agents have been killed with Grant leaving a captured Bakshi as a present for Coulson. Grant calls Skye on Bakshi after and suggests that there will be more present such as Bakshi and tells her he has never lied to her. The last scene shows Grant loading a magazine with his brother’s picture into a duffel bag after he shaved his beard. Ever since it was revealed at the end of season 1 that Grant Ward worked for HYDRA fans have speculated how the character can possible come back to the light side. In the previous episode while Grant was in custody Coulson labeled him as a psychopath proofing the creative staff aren’t just going to give him the redemption his character is seeking. Instead, what I hope is that Grant will never find redemption but instead become an agent who creates his own missions perpetually moving between light and dark. Strangely that was how he worked while he was agent Grant Ward for SHIELD but spied for HYDRA. 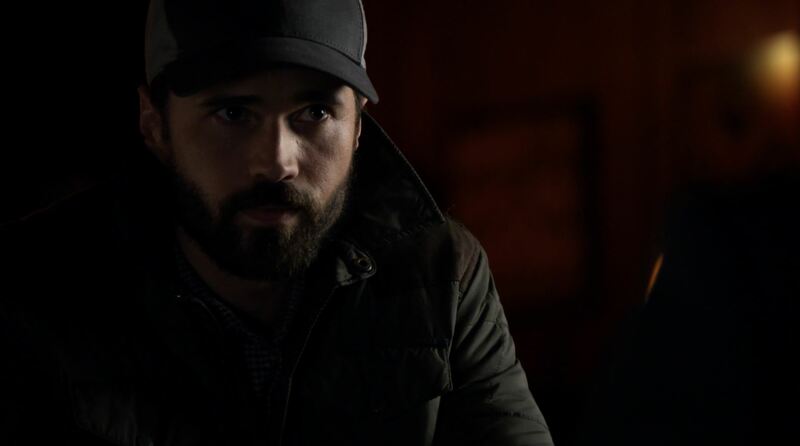 Brett Dalton’s excellent acting gives Grant Ward the necessary depth that some of the other SHIELD characters still lack. Score; 9.2 / 10. A surprising episode with leading roles for Clark Gregg as Phil Coulson and Brett Dalton as Gregg Ward with just a hint of filler material here and there. This was the review of Agents of SHIELD The Writing on the Wall, the seventh episode of its second season. Please do comment below on your opinion. 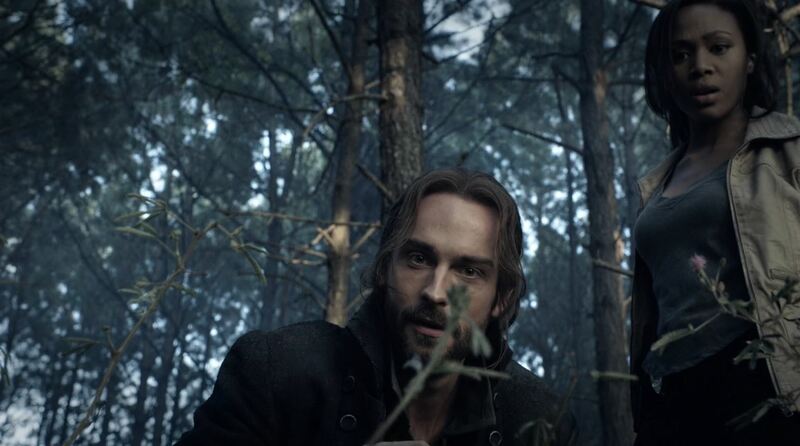 I hope I will see you back next week for the episode The Things We Bury. Below is the preview trailer of The Things We Bury, I hope you enjoy it. I can’t wait for Kyle MacLachlan to take center stage.